Country music superstar Jason Aldean's son Memphis has taken his first steps! Watch the cute video captured by Brittany Aldean here! Country music star Jason Aldean and wife Brittany have a walker on their hands. That’s right, the couple’s 10-month-old son Memphis has taken his first steps! Watch the cute video of the youngster walking towards a bulldog stuffed animal below! Oh goodness, his striped footie pajamas and little squeaks are too adorable! 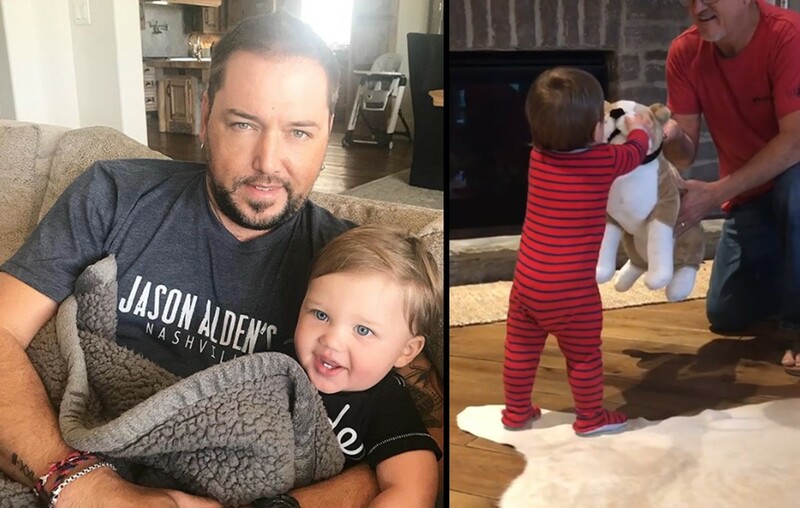 Right now, the Aldean family is enjoying some downtime at home after wrapping up the High Noon Neon Tour with special guests Lauren Alaina and Luke Combs at the end of September. As previously reported, Jason and Brittany are expecting a baby girl and are currently building their dream home in Tennessee. Their newest addition will join big brother Memphis and big sisters Keeley and Kendyl from Jason’s first marriage to Jessica Ussery. In case you’re wondering, the Aldean’s current estate is for sale— tour it here. Be sure to share this update with other Jason Aldean fans and enjoy his latest!